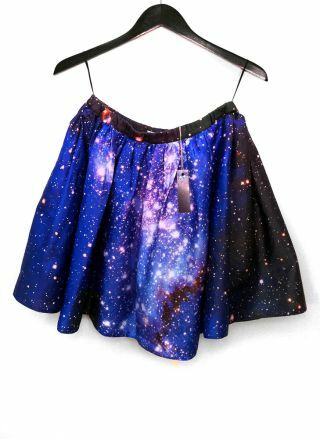 A skirt by Shadowplay NYC features a Hubble Space Telescope image. Fashion-minded space geeks rejoice! A new line celebrates the beauty of the heavens with clothes printed with Hubble Space Telescope imagery. After more than 20 years eyeing the heavens, Hubble is perhaps the most famous telescope ever known. It was launched in 1990, and has been visited five times by space shuttle servicing crews. The aging orbital observatory is still going strong, its operators say, and continues to release breathtaking photos of space. The new space-themed fashion line, called Shadowplay NYC, is an independent label based in New York. Started by two graduates of Parsons The New School for Design, Ximena Chouza and Ali Bennaim, Shadowplay offers skirts and dresses digitally custom-printed with photos of star clusters, gaseous nebulas, and swirly galaxies. A dress by Shadowplay NYC features a Hubble Space Telescope image. The two founders say they aren't sure when the idea for the line struck them. "We always come up with the best ideas at the most random times," Chouza and Bennaim told eco-fashion news website Ecouterre. "Whenever we are joking around and suddenly something amazing comes up and we try our best to make it happen." The clothes are handmade in the duo's Manhattan studio. The Hubble photos are printed on locally-sourced fabrics, mostly silks and cotton sateens, Ecouterre reports. Shadowplay NYC, a clothing label, has a studio in Manhattan, NYC. "As a small brand, I think it is extremely important to be fully involved in every step of the collection, from the creative process, to production, selling, and even interacting with customers," Bennaim said.